Art Soup: Happy Blog Hopping! getting inspired by all of the projects to make. 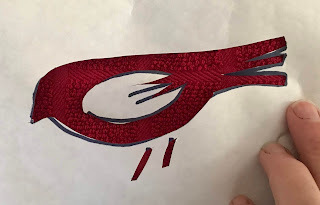 I decided to revisit the use of freezer paper stencils to create a design on which to stitch! I tend to get into a rut and fall into the routine of using the same few techniques over and over. 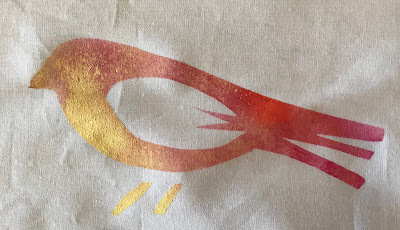 I forgot how wonderful and easy making stencils with freezer paper can be. ironing them to fabric, and painting them with acrylics. I drew a simple bird on freezer paper and cut it with a fresh, new Xacto knife. 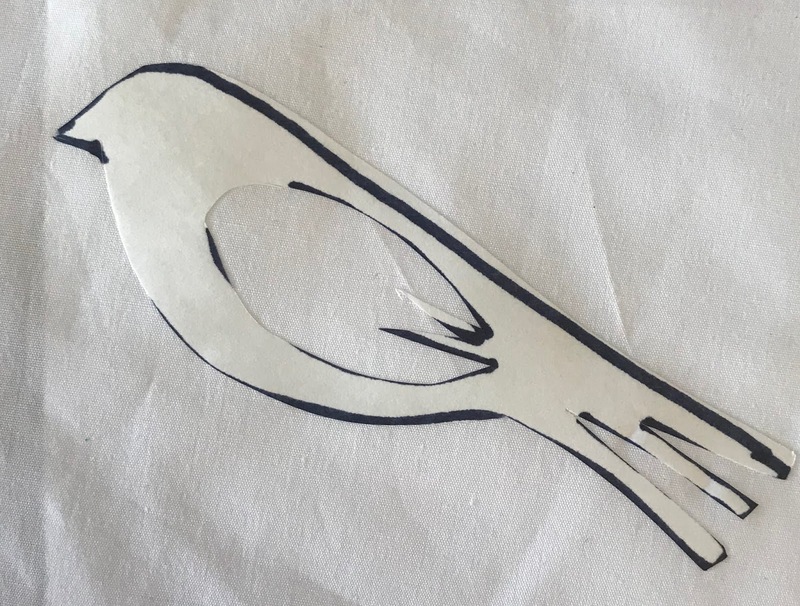 Here is my cut stencil, against a dish towel to highlight the detail. After ironing it onto white muslin, I dabbed on a light coat of acrylic paint. 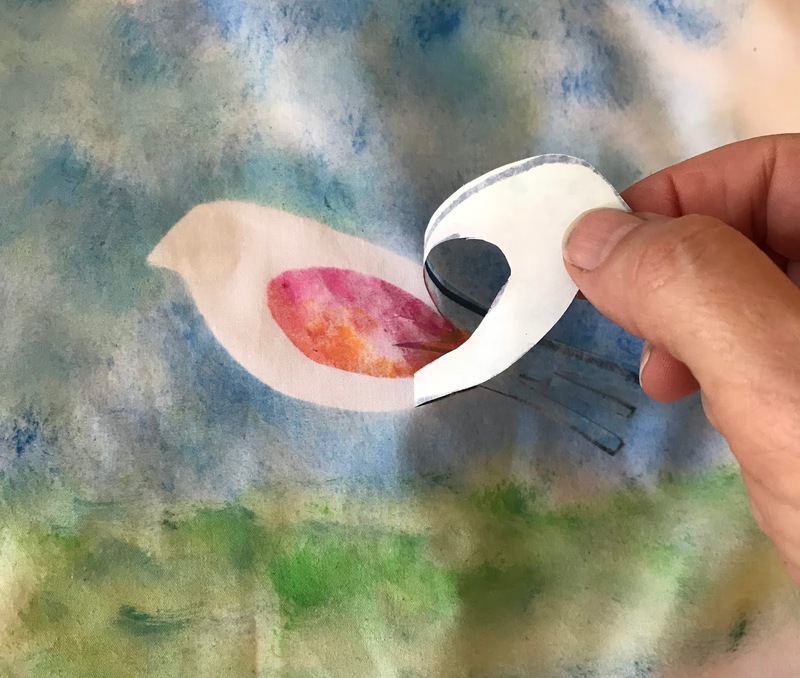 Lynn recommends removing the paper stencil promptly before it sticks to the fabric. Heat set it with an iron after the paint is dry. And here's the piece of the stencil I removed. I decided to paint the negative shape also. I cannot help myself. 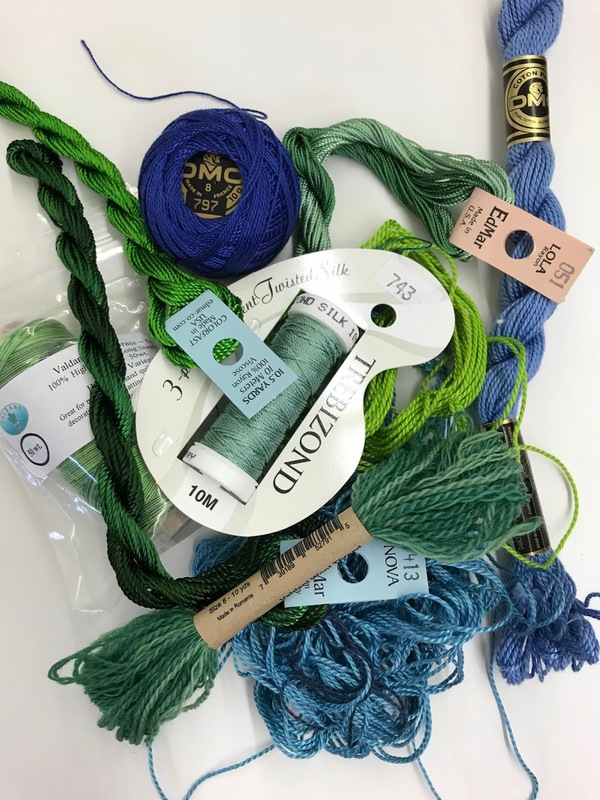 I love thread! I share Lynn's approach..."if I can thread it through a needle, I'll stitch with it". I decided to use my first stenciled fabric rather than the 'negative shape' piece. First, I layered my stenciled fabric onto some of my hand-painted scraps. I chose a few basic stitches and I dove right in. I forgot to stop and take some pictures along the way. I highly recommend Lynn's beautifully illustrated book. Her instructions are clear and the projects are fun and inspiring. 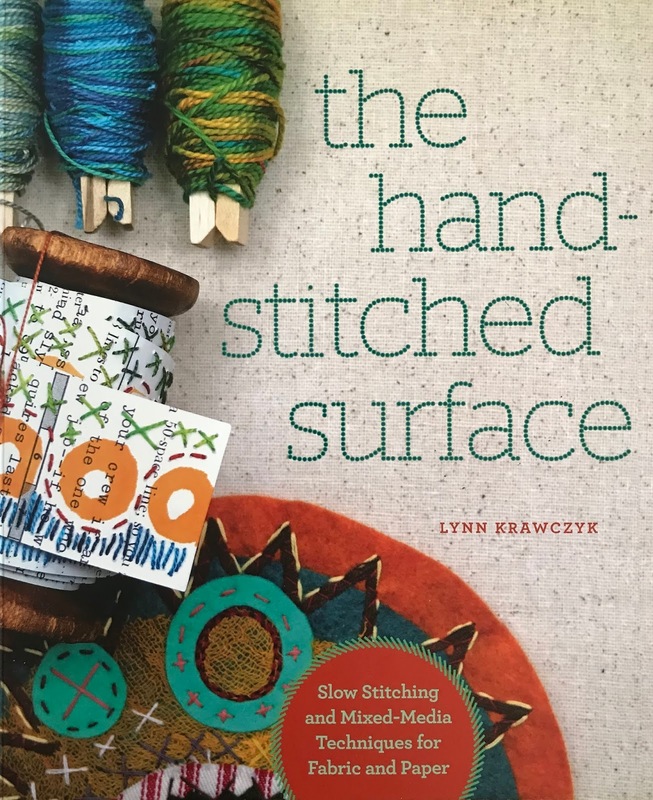 Check out the Lynn Krawczyk’s wonderful book, The Hand Stitched Surface. Leave a comment below for a chance to win a copy of Lynn's book. The winner will be drawn next week. And be sure to visit the other artists wonderful contributions to the blog hop! Love what you did. Excited to read Lynn’s book. How fun! Good stuff from 2 of my favorite people. Adorable bird! I haven't used freezer paper stencils, but might have to do that now. I'd love to see Lynn's book to learn more of her techniques. Freezing paper stencils looks like a blast! So many possibilities, and tons of opportunities. The benefit of blog hops is being reminded of techniques long in the dust bin of the memory. Thank you for always inspiring, today and in the past. Love how you incorporated the bird and bits and pieces of cloth. Wonderful. 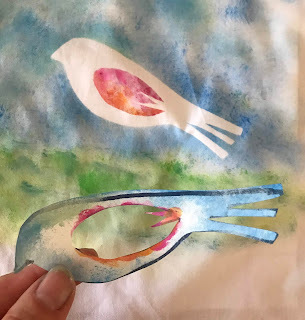 Love the freezer paper stencil technique, and your stitched bird. Thanks for sharing this technique with us. Wow! That's a cool idea! What a fun project and you made it look so stress-free. Thank you! I would love to have your book. 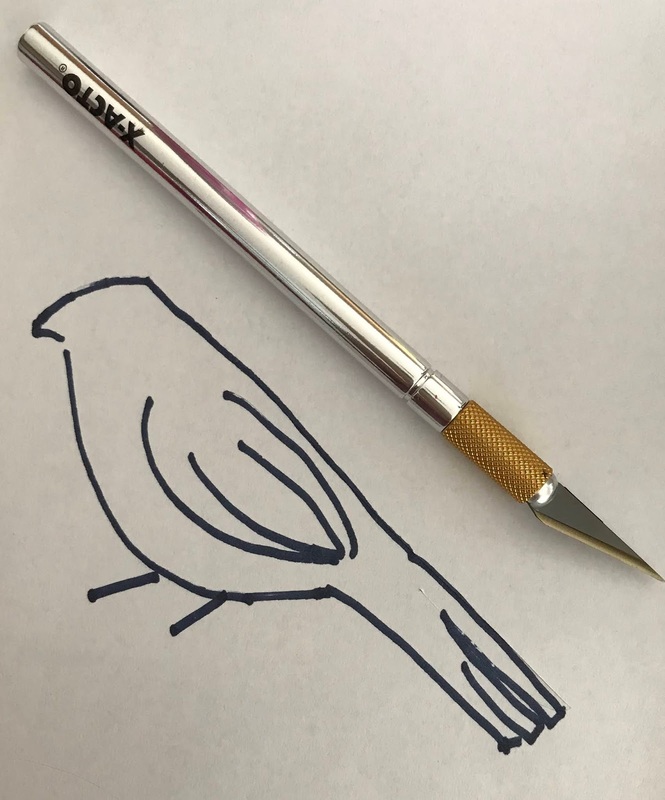 Great idea, lovely art techniques. Thanks for sharing. I used a freezer paper stencil a long time ago and forgotten about it. Now I have to do another that wants stitches. Love your description of how you worked this piece. Very nice piece! Love your bird ! It NEVER occurred to me to use freezer paper as a stencil -- awesome! Thanks for sharing. Love your take on the concept. Really liked your negative space. 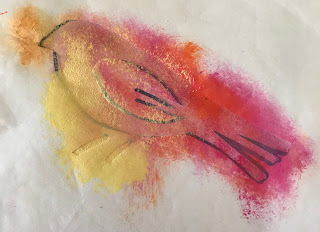 Love the idea of using freezer paper for stencils. Thank you for the reminder! Freezer paper is so useful for so many things. I love your project. So fun! Thanks for sharing!! You and Lynn always have the coolest ideas....and actually DO something with your plans. So glad Lynn chose you as one of her blog hop artists. Thanks for your post. I love your stenciled bird. And I love Lynn's work too. 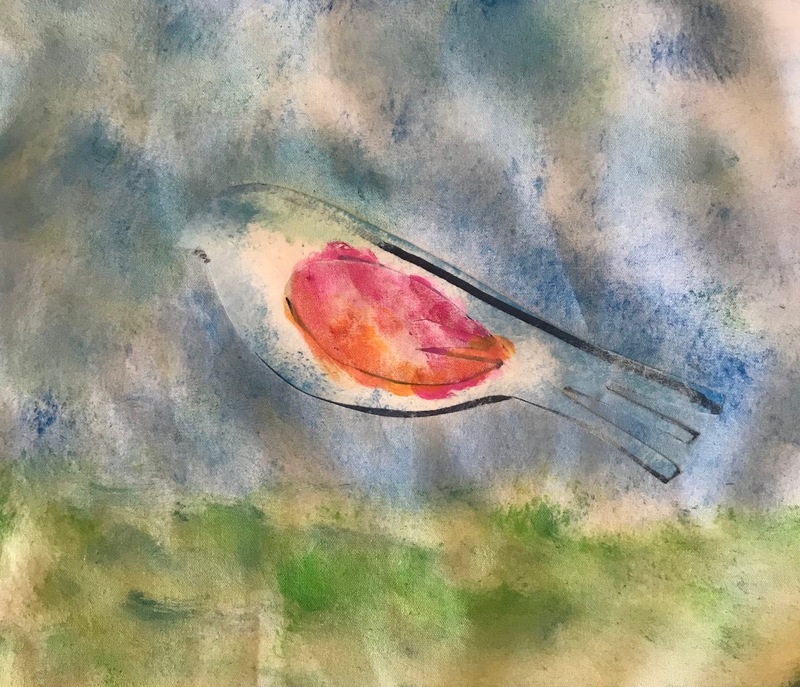 I love the way you used the stitches on your bird collage. So cute! lovely work here...and in QA magazine! Reading through your post definitely helps get me out of a rut....so many new ideas to try. Thanks for sharing and thanks for giving me a chance to win Lynn's hand-stitch book. Fingers crossed. I love your little bird tip! Your little bird is so cute! Enjoyed your creative combination of stenciling, applique, stitching. Just beginning to experiment with hand stitching. I guess I am embracing a slower life style! 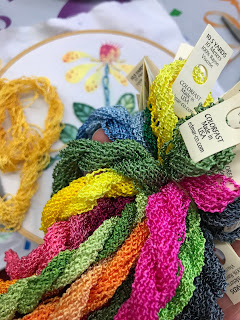 Could you please share what your favorite needle is for hand stitching? I love your freezer paper bird idea and will be trying something like it this week. I have begun trying to experiment each week with something different until I find my passion. Been a fan of Lynn's fabric designs...now I know I need this book to continue my exploration of hand stitching. Love being introduced to your work. Wonderful collage with stitches! I can see that Lynn has great suggestions. Growing up with creative, artsy parents, Libby’s childhood was a world of fabric scraps and yarn, pins and needles, paint, Elmer’s Glue, and a whole lot of Scotch Tape. Needlework projects were always in the works. School-day afternoons were spent fashioning doll clothes from remnants, embroidering on anything that could hold a stitch, and learning the art of patchwork quilting. As an art major in college, she focused on the classic techniques of printmaking but still found time for knitting and stitching projects. 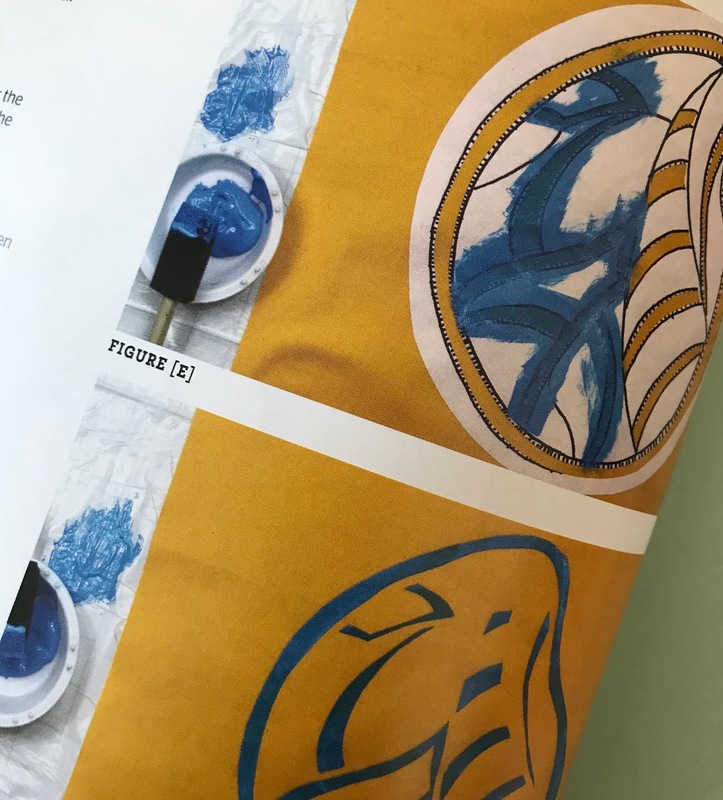 Her printmaking background led her to a passion in surface design on fabric which her current work reflects. Though she has constructed many a quilt with traditional quilting techniques, her current passion is in the making of art quilts using layers of painted and dyed fabrics, appliquéd layers of free-motion stitched components and embedded found objects. 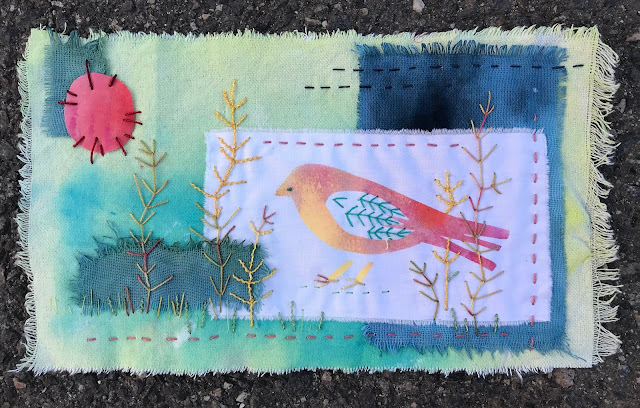 She is a proud hoarder of all things “fiber” and thrives in a world of stitch and sew. 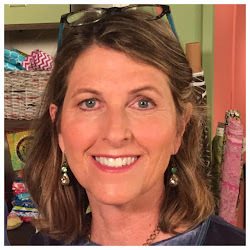 Libby teaches art, crafts, art quilting and sewing to students of all ages in her studio in Old Town Orange, CA and at destination retreats. In her world, not much can trump paint caked beneath her fingernails, glue in her hair, and a bowl of ice cream.